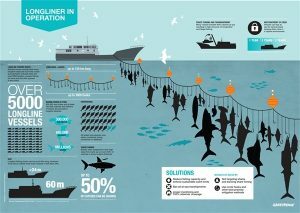 Longlining And The Devastating Effects On Sharks - We Love Sharks! Longlining And The Devastating Effects On Sharks - We Love Sharks! Although longlining is a popular fast fishing technique, it has devastating effects on sharks and other sea creatures. Fishing involves the use of several techniques. Some are commercial and advanced – others are traditional and primitive. The use of hooks, for instance, is a fishing tradition that dates back to ancient times. Longlining is a modification of the most basic fishing technique that uses hooks. But why is it so devastating to sharks? Traditionally, fishermen have been using lines and attaching baited hooks at the end of the line to catch fish. It often involved catching one fish at a time. However, as the human population grew, newer faster methods were necessary to cater for this enormous population. Hence, longlining came into existence. Much like the traditional line and hook method, longlining is a commercial fishing technique that uses a long line commonly referred to as the main line. This line goes in the water and stretches for hundreds of miles with baited hooks attached at intervals using branches. These branches are called snoods, leaders, or gangions. Buoyant plastics are used to keep the snoods afloat in coastal and inshore fisheries as well as offshore fisheries. Longlining can be either Pelagic longlining or Demersal longlining. The latter being deep-sea suspension of snoods while the former is near-surface suspension. Hundreds and thousands of baited hooks can hang from just one line depending on how large the fishing endeavor is. 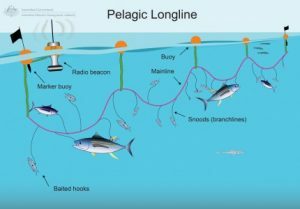 Longlining was originally aimed at large fish like tuna, sablefish, swordfish, and halibut. However, with time, there has been a significant increase in bycatch (unintended catch) especially of different species of sharks. Longline fishing is notorious for bycatch and has caused the death of many dolphins (such as the false killer whale), seabirds, sea turtles, albatrosses, and sharks. So How Does Longlining Actually Affect Sharks? Sharks are susceptible to longliners hooks as by nature many species have to be on the move to breathe and in search for food. Because of their ability to sense struggling prey even at a distance, they are inevitably drawn to the fish already trapped by the baited hooks. The shark attempts to eat the hooked fish and sometimes it may get away with it. However, many times it won’t and will also get caught. The shark may eventually break free from the line but it will suffer the consequences of the hook. Swallowed hooks often get stuck in the throat causing internal injuries to the shark. The injuries could potentially lead to death from starvation or internal bleeding. Unhooking would be a challenge, and thus they would swim away to slow and painful deaths. On the other hand, some hooks break off on their own due to age, etc. A broken baited hook can drift for miles in the ocean, and if some unlucky sea animal gets to take the bait, they are in for trouble. In the early days of longlining, sharks were seen as having no economic value and thus were often just cut loose. However, in more recent times, there is still a sustainable demand for shark fins in the Asian market. Shark fins are used mainly to make shark fin soup. Shark fin soup commands a premium – up to hundreds of dollars for a bowl. This market has led to many concerns intentionally fishing for shark fins. In the event their longline snags a shark, instead of setting it free, the fishermen may decide to chopped off its fins then throw the still living animal back into the sea – bleeding and writhing in pain. Sharks are generally considered as a vulnerable species for overfishing because they take long to reproduce. Many shark species can take between 10 to 15 years to reach sexual maturity. Furthermore, unlike other fish that lay millions of eggs, a female shark may bear just one pup a year. Since fishing is a routine activity, continuously disturbing their ecology would not allow time to replenish lost populations. The largest fish on the planet today is the Whale Shark. They are particularly loved by divers as they are docile. Divers often swim with the whale shark for recreational purposes. Due to its calmness and curiosity, it is not afraid to approach boats and ships. But, this characteristic of the whale shark renders it more vulnerable to being trapped not necessarily by the baited hooks but by entanglement as it follows the longliner vessel. How Can The Effects Of Longlining On Sharks Be Mitigated? 1) Implementation of laws to protect sharks. There are some regions where longline fishing is already prohibited. The US Pacific Coast is an example. Sharks would be safe in these areas. However, you cannot confine a shark to a single shore; they’ll just swim away. Also, longliners operate on international waters where these rules and policies regarding how and where to fish do not apply. The only way to enforce such controls and protect endangered species in international waters is with the intervention of international organizations such as the UN. Making information and latest fishing technologies available to fishers would provide a milestone in shark protection. Providing information on how to handle such creatures well in the event they encounter them at sea would also increase their survival rate. Since it would be impractical to stop commercial fishing all together just yet, there can be better research into technologies that will help with catching targeted species only. For instance, techniques as the use of circle hooks rather than the “J” hooks to save sea turtles. Sea turtles are also extremely prone to getting caught in longlines. An ecosystem’s health depends on the survival of every animal, and sharks are no exception. Sharks have lived on this planet for millions of years and things should remain that way. A world without sharks is a not an ecosystem.